[XPB-COMBI5600] *DISCONTINUED* Our Front Mounted 5-Sided Stainless Steel Combination Unit is fabricated in Type 304 stainless steel with exterior surfaces having a beadblast finish. All exposed welds are ground smooth. 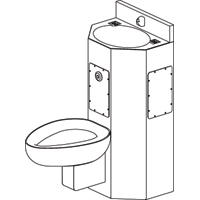 The lavatory is Die-drawn oval bowl has multiple-hole fast drain with air vent. Self-draining soap dishes are formed into countertop. Lavatory bowl measures 13-1/4" x 10" x 5" deep. Lavatory waste must be chosen from selection list. Options include: self-closing, pneumatic metering, and electric metering valves. The toilet is Elongated die-drawn bowl has blowout jet action for positive fl ush. 30 PSI (flowing into flush valve) required for flushing. For shipping quotes, orders or questions please call our customer service center at 1-877-483-9270.